Yea I’m Late… So sue me. I will attempt to share a well thought out perspective on aspects of the mega blockbuster film The Dark Knight. While this write up wont serve as a true to form review of the film (I’m sure you can find that easily enough), it may help define this films place in the storied Batman franchise history. It would be easy to make this post about Ledger’s portrayal of The Joker, dissecting whether the praise his performance seems to warrant is indeed deserved or if simply overly sentimental fans offer a ballyhooed send off for the actor in his final role. However to do that would discredit what is undeniably an epic film in a famously storied franchise. Batman as a character has been portrayed in a myriad of mediums ranging from the pulp fiction style detective comics of yesteryear to the campy television series most fans familiarize themselves with, to cartoons with beautifully scored opening sequences true to form, to ultimately film. Within those many different mediums are equally diverse renderings of The Batman. While purists would argue that the Dark Knight as a character is indeed a story meant to be told with equally dark overtones, Television and Hollywood executives with dollar signs in their eyes disagreed. We’re all mostly familiar with the Adam West style of Batman, The KaPow’s and Bamf’s that accented fight scenes. The intentionally cheesy dialog that often betrayed the truer origin of Bruce Wayne. The Batman franchise would have languished in the limbo of this embodiment if it weren’t for the efforts of Frank Miller. Frank Miller’s comic portrayal of the caped crusader not only shed light on the pathos that Batman entails, but reignited an interest in The Dark Knight. Miller’s Batman would ultimately pave the way for the first incarnation of the brooding, often somber, burdened and at times loathsome Batman we’d all first become familiar with via Michael Keaton in Tim Burton’s Batman, this blueprint for the seemingly anti-hero set a precedent for fatally flawed would be saviors’ that flood the cinema from the late 90’s to today. Both critically and commercially successful, Burton’s Batman would spawn a sequel before the interest of gaining a wider demographic, namely children, would once again alter the face of Gotham’s savior. Widely panned by fans and critics alike, Batman Forever and Batman and Robin, starring Val Kilmer and George Clooney respectively, almost put the nail in the franchises coffin yet again, until Nolan’s revival in Batman Begins. Finally there was a version that evoked true to form the sentiment we all felt Bruce Wayne to have. The story in itself is tragic. A child witnessing the murder of his parents at the hands of a lowly thug, thus inspiring the downward spiral that would bring about simultaneously our greatest and most tormented hero. The beauty of Batman first expressed in Miller’s work then later in Burton’s and Nolan’s is the anguish on display for the world to see. The burden that his shoulders strain to carry and how we as voyeurs see reflected through the silver screen, an ordinary man who aspires to extraordinary things, even if the means of his journey is devastating in its inception. However, as steadfast, stoic and tragically driven the persona of Batman was guaranteed to be, his villains were always the action that drove his reactions. In the darker films the Batman character is nearly interchangeable, not to discredit Keaton or Bale for their performances, but it was always the villains that seemed to get preferential treatment from the film makers. 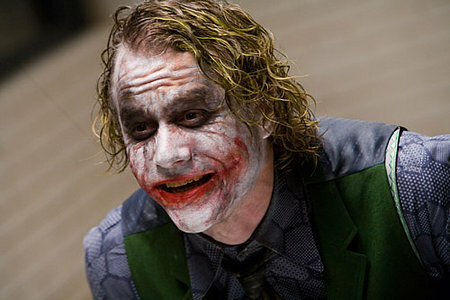 After all… it was the villains who made Batman necessary and no villain was greater than The Joker. In Burton’s Batman The Joker, played by the legendary Jack Nicholson was a devilish, dapper, maniacal mastermind. As Debonair as he was devious, The Joker while masterfully brought to life by Nicholson, almost didn’t seem to be a stretch for Jack. Sure the grin was exaggerated and he might have been wearing a bit more makeup than usual, but it was within the realm of who Jack Nicholson was, merely amplified. Ledger’s Joker lacked the neat calculating composure that Nicholson’s joker offered in the previous incarnation, opting instead to scrape the bottom of a psychopath’s nightmare for direction on playing The Joker this time around. Masterful doesn’t approach the truth when describing the portrayal. Detractors will state that sentimental fans are making more of Ledger’s performance than need be, yet I reflect those remarks and am infinitely more a fan of the franchise than of Ledger having never seen him in a movie previously save The Patriot. My mindstate appraoching this film was to poke holes in Ledger’s performance having the prototypical Nicholson portrayal in the forefront of my mind… my prejudice was soundly refuted by a performance that should have marked the ascension of a true talent, yet merely serves as one of the final, and perhaps most brilliant flickers of light shone upon a talent cut short. The Dark Knight, served to expand the canvas Nolan set to construct since Batman Begins, and no better way to test the mettle of our hero than with his greatest foe. Unfortunately the bar is now set so high, that any revisiting will struggle not to prove an exercise in futility. The greatest embodiment of Batman’s greatest foe cannot be recreated. This is perhaps the fatal flaw with the Batman franchise… eventually you run out of worthy adversaries. Batman is reactionary as are most heroes, yet Batman differs in the respect that he will only be there to defend his city so long as the people need him, ultimately hoping that there will come a time when the symbolism Batman represents will inspire those he sought to protect, to stand up and protect themselves. You either die as a hero, or live long enough to become a villain.